There are some odd places that serve food in this world. The ones that stick out in my mind are the mobile food truck/van establishments. Someone can stand in the back of one of those and take your money and cook your lunch while barely swiveling at their waist. Where’s the weirdest place you have acquired a meal? The weirdest place I ever acquired a meal was actually several different places, all scattered about a big store named Costco. Probably the only time it’s a good idea to go shopping while hungry. 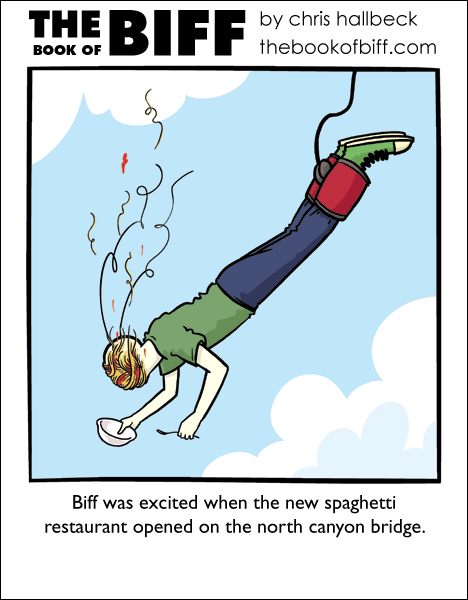 As long as the bungee cord isn’t made of pasta. Man, I don’t know what’s considered normal food consumption. I eat food that is handed to me from windows in the sides of buildings while sitting in a moving car going at speeds of up to 70 mph, and I hardly notice. I have snacked upon munchies whilst crouching at the sides of highways in what would otherwise be an entirely featureless, neverending plain. It’s crazy! I once had a paper plate filled with cold beef and broccoli handed to me in the turret of a humvee, ten minutes before a patrol. Nothing quite like breakfast with a machine gun. On my way home to Pennsylvania from North Carolina after saying goodbye to my boyfriend before his deployment. I was incredibly sad and shaken up, and then came across a roadside pancake stand where a man and his wife woke up every day to make pancakes on a grill griddle by the side of the road for work commuters to buy. I bought some pancakes, and then they gave me free coffee after they asked why I was out so early in the morning. Take care not to confuse your own brows for noodles. Lunch from a guy with a cut-in-half 55 gallon drum grill parked next to the curb near where I used to work. That guy made the best dam ribs, I swear. Oddly, there were never any homeless persons anywhere near there, but I bet that was just a coincidence. I ate a bowl of Cerial today. Most dangerous breakfast ever.. I mean, what if it got caught in my wind pipe! I would be majorly inconvinienced for a good few seconds. I think we’re missing a key factor here.. he jumped without the garlic bread! My kitchen is very similar in size to these food vending vans. I think this is probably bad for my posture, though I hope more edible things emerge from it. No, nevermind. I guess buying burritos from the ladies in the Wal-Mart parking lot, but those are delicious and they’re like 50 cents a pop. Why are there sausage stands in front of the Home Depot? @Julie – You would be less likely to see them if they were around back. I’ve often foraged for meals from the trees around campus. During the warm months, I have occasionally bought tamales and/or meat pies from people who walk into my workplace. Hot, greasy, spicy food fresh from the wheeled Igloo cooler, now that’s a good lunch. If i’m lucky, they may have some big pieces of frybread to sell as well. It’s a small town, so usually the people selling are relatives, I can trust the food. I bought the best fish tacos in the world from a very badly beaten up 60’s delivery van in Providence RI that simply had the word “foode” spray painted on the side. $1.00 for three tacos and 20 minutes listening to Babu talk about fishing and as often as I could I would find that van!!!!! They recently discovered a fifth taste bud which detects MSG. So now we can taste sweet, sour, salt, bitter and umami, the word Japaneese already used for the taste of MSG. Recently I was driving down a road taken over by strip malls. There was this fancy looking restaurant called Umami’s. Would you eat a place called MSG’s? Now that’s weird. On side note, mobile Greek restaurant had provided such delicious food that I almost cried when I found the next day they weren’t there. :'( Oh how I miss the chicken, yellow rice, and generously spiced pita bread. My wierdest was going to Safari West ( http://www.safariwest.com/ ) and having a gourmet meal after a lovely tour seeing the cheetahs and other animals. It was odd to have French Onion soup, perfectly cooked ribs, etc in a 4 course meal, then to walk 25 feet and watch cheetahs run about. After Hurricane Katrina, there was a large influx of Hispanic workers to help with the rebuilding. And with them came….Taco Trucks!! Yay!!! A lot of them (both the workers and the trucks) have stayed, adding one more flavor in the cultural/culinary gumbo that is New Orleans! Oh, and Libramen, I assume you meant a 6′ (six-foot) vendor. Unless you really do have tiny little 6-inch people serving you food from a truck, which would be kind of fun! Two Stories for this: First was standing on the edge of a giant field in a full war kilt buying some unidentified meat-on-a-stick from a guy dressed as a jester while watching about 5,000 guys (and gals) in various bits of armor charge across at each other screaming. Second was the Restaurant that never was: Me and four friends were renting a house when we got a door hanger from a place called “Roller-Chicken”, a delivery chicken place. We thought it was a great idea (being a bit tired of pizza) and ordered. It was Great! A few days later we called again, and the person on the other end of the line informed us the restaurant wasn’t open yet and to call next week. We called the supposed day of the grand opening, no answer. Again the next day, and again a few days later… no answer. In short the place closed before it ever opened. And we ate food from a restaurant that never really existed. @i.half4 According to my English-Japanese dictionary, umami means flavour/taste. Wikipedia says it’s used to describe savouriness, another basic taste in Eastern cultures. Flavour enhancers like MSG increase the savouriness (-ness?) of a given food, however savouriness does not necessarily equal MSG. Also, umami is not used solely to describe savouriness (used by itself, as in a name, can mean simply “Good Flavour”). The Japanese equivalent of monosodium glutamate is “ajinomoto”. First, mountain restaurants. On popular mountain trails in South Korea, there are occasionally little shacks that sell sort of fried savoury pancake things, quite literally 3/4 of the way up the mountain. No car access, so one wonders how they get their supplies, short of hauling it up on their backs. Second, sidewalk restaurants – there is no wall, no real tables, only little plastic stools, no kitchen – only a portable gas burner and a giant pot. God only knows how they clean the dishes after you’re done with them. Food carts are pretty common in Portland. There’s one or two city blocks that are just completely filled with them. They usually have pretty good food. I get stuff from them whenever I can. The weirdest place I’ve ever gotten food was this waffle stand, not ’cause of the placement or anything, but because I had been totaly unaware of the existance of waffle tacos before that point. There are more than one or two city blocks in Portland filled with food carts. At last count, there are at least 6 different city blocks full of them. Many of them are owned / operated by gourmet chefs. The cost of opening a cart is significantly less than opening a restaurant and allows for greater flexibility (menu / hours / prices). Plus, the chefs get to see their customers. I remember eating at a place called Todai. It was weird because it had everything I could ever want out of a Japanese restaurant. ahah umami is a flavor enhancer. Also, in Japan they make(made?) these huge blocks of basically pure MSG from seaweed, i believe. Yes, a sophomore in HS has just read a chemistry cook book thing. ARENT HIS EYES BURNING?? or wait, has it cooled off? I recall seeing a restaurant on top of a mountain that you actually have to climb up to get to…in a picture. 2 places tie for craziest from where I’ve actually been…#1: Rainforest Cafe, #2: The Melting Pot (A Fondue Restaurant). Some of the little restaurants they have in disney world are pretty wacky. I remember one that purported to be a tiki bar… It was closer to a snack bar honestly, but you could sit there and watch an animatronic show featuring Iago from Aladdin while you ate. There was another one like that with an animatronic alien that would sing for the customers. They also had all the staff at that one in futuristic-looking uniforms, even the janitors. Kind of cool, really, but sometimes Disney just doesn’t know when to stop. Weirdest meal/place: Midnight at a street vendor stand made out of an old bus in the middle of Rio De Janiero, eating unidentified broiled mystery meat on skewers, washing it down with Brazilian sugar cane white lightning. Man. Tasted great and somehow I escaped getting food poisoning or worms or something. I once got Chicken Marsala from a gourmet restaurant attached to a Conoco. They also had things with duck in them. Great food. When eating spaghetti, does Biff ever find himself slurping on an eyebrow?